The distinctive appearance of VBD's fabric designs is also entitled to trade dress protection under Section 43 of the Lanham Act (15 U.S.C. �25). Vera Bradley has a number of trademarks but none that we could locate in the principal register. And what a lie by Very Badley! Very few people would look at one of her designs and know it was a Very Badley Design which is a requirement for trade dress claims. Molly Michael, of Enforcement at Vera's House of Ill Repute, and another clueless twit who appears not to be able to get an honest job, claims in a recent email to ETSY that several ETSY listings violated Vera Bradley's trademarks even though the name Vera Bradley is not mentioned anywhere in the listings. The crime? Using the "distinctive appearance of VBD's fabric designs". Trade dress does not apply to the product line but rather something that makes the line iteself distinctive, like the color green on farm equipment. We can only hope one day someone will sue Vera and stop her foolishness. Laurel Burch was a distinctive designer. Vera Bradley is just disgusting. 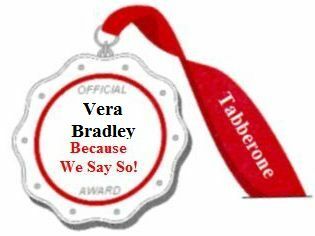 Vera Bradley Designs, also known as Very Badley Designs (because of their bad-itude), is now a proud winner of the Tabberone WESAYSO Company Award. Where to begin? There's so much wrong about their eBay VeRO Page and their web site legal page. The legal misrepresentations are so numerous that they have to be intentional. These pages are a primer for anyone who wants to study how bottom-feeding corporate lawyers lie and misrepresent their legal rights and minimize your rights. Looking for New Vera Bradley� Products? You won't find them on eBay. Wrong. What they don't want you to find on eBay are new Vera Bradley products being resold so VBD redefines the meaning of new. VDB claims that it is not new once you have bought it. WOW! That works. What in the hell do they think they are doing? Nothing in trademark law or copyright law or any other law gives Vera Bradley and her corporate lawyers the right or the power to redefine a word to suit their attempts at controlling the secondary market. If you are a consumer reselling a product that has been purchased from a retail store, you may not claim that the product is new when listing it for sale. Alright Very Badley, please show us a law or court ruling that supports that claim. You cannot because there is none. This is a lie and Vera Bradley and her bottom-feeder corporate lawyers know it. This is a lie and you know it. But, VBD believes that if the lie is told often enough then maybe it will become true. In addition, if you suggest that your goods are new, ... this would be false advertising. Not if the item is new. False advertising requires someone to make a false statement of measurable fact. It is new if it is still unused and in the original wrapper (if it came wrapped). Did your lawyer actually attend law school or did you place a want ad and hire the first applicant? These activities violate Vera Bradley�'s rights. Not per se, they don't. There is no violation of anyone's rights if the seller is telling the truth and accurately describing the product. The definition of "new" is not subjective and not determined by Very Badley. All products sold at the annual Vera Bradley� Factory Outlet Sale are sold on the condition that they will be used solely for personal use and not for resale. Any sale of such goods will be in violation of the condition, and will not be a legitimate sale of Vera Bradley� products. Based upon what law? Please, show us any statute that gives you the right to impose restrictions of this type on a product being sold to the public. We can show you one that says you cannot. It's called the First Sale Doctrine and is part of US Copyright Law. Without a signed contract, your conditions, that is your lies, are illegal and unenforceable. They (the flea market) are not allowed to sell it. Vera Bradley� makes an effort to prevent the sale of unauthorized products, but some occasionally filter through. However, both their sale and any downstream sales are unauthorized. Again, based upon what law? Vera Bradley's corporate lawyers keep pounding away at the same theme but where's the meat? Not between their ears. Unauthorized use under the Lanham Act deals with counterfeit marks and counterfeit goods. Not actual products. And Vera, what part of the First Sale Doctrine specifically exempts you from federal law? Nothing that we have discovered. Vera Bradley� owns the copyright interest in the photos and text that appear in its promotional materials, on its web site, and on product packaging and tags. These materials cannot be lawfully reproduced by anyone without permission from Vera Bradley�. Whew! Wordy and not completely true. Text on packaging, as well as technical data and specifications, are not copyrightable and therefore can be copied, word for word. Promotion text use is lawful if it accurately describes the item being sold. And, we seriously doubt that a court would find use of a stock photo to be copyright infringement. Copyright law specifically states that the use of photographs to sell an item is not infringement. The Vera Bradley� name, trademarks and service marks belong to Vera Bradley� and may not be used by anyone or any business without the company's written permission. Wrong. Fair Use under trademark law allows the use of the name and trademark to accurately describe the item being sold. Permission is not required for that. Vera, you paid for this legal advice? Ask for a refund. Vera Bradley's boys harp on whether the item is "new", by their definition. Play ground bullies is all they really are. Shame on you, VB. You and your corporate hacks don't have to lie to protect your trademarks and copyrights. But you are. You really are trying to control the secondary market. You're the type who used to have their lunch money taken during recess and now you have the legal jargon to use to beat up on others. That makes you a loser in our book. And we do not understand why you would take the time and spend the resources to do this. You have your money. These are genuine Vera Bradley products being lawfully resold. It is not like VBD is being cheated by these people. So why, why are you being such assholes? Drain Bammage? Use consumerwebfaq@verabradley.com to contact VB by email. Vera Bradley also qualifies for a Dodo Cluster on their WESAYSO Company Award. An eBay seller, crazycoolaccessories, had 7 auctions terminated by Vera Bradley in March 2007. eBay has also suspended crazycoolaccessories because of these auction takedowns. To view a similar auction to those terminated CLICK HERE. "If an item was not manufactured by Vera Bradley� or originally sold by Vera Bradley�,.... You may not use any Vera Bradley� mark in the title of an auction...." . Whoa, there, Skippy. crazycoolaccessories was selling an item made from Vera Bradley fabric. That makes the fabric manufactured by Vera Bradley. What is the purpose of selling fabric? Yes, you Dodos, to make stuff. You unlawfully terminated these auctions and got a legitimate eBay seller suspended. You are pathetic. Another Snow Job In March, article by the Berry Street Becon on March 16, 2008, about Vera Bradley lying about plant closures in Indiana. Plant closings will result in 537 layoffs, article by the Business Weekly on March 21, 2008, about Vera Bradley lying about plant closures in Indiana. Workers who made Vera Bradley items qualify for assistance, article by the Business Weekly on May 16, 2008, about Vera Bradley's laid-off workers. Handbagged: Vera Bradley Puts Three Fort Wayne Companies Out Of Biz, article by Taking Down Words on May 14, 2008, about Vera Bradley lying about plant closures in Indiana. The problem with the "claim" that Vera Bradley will be bringing these laid-off workers in-house is the gap, or down time between the closings and the new facilities. Perhaps when Patricia Miller really means is they will be brought in-house if they move to China and apply for work at a factory there? And since most of the knock-offs come out of China, putting her designs and products into the hands of the very people who will be infringing soon, and China will be, is a master stroke for Vera Bradley. Geniuses these people. Do we see a pattern here? Vera Bradley is moving production to China causing the layoffs of over five hundred workers and lying about re-hiring these laid-off workers. Vera Bradley, All American Manufacturer is saving money by having production moved to Communist China where the workers are housed in barracks and virtual slaves to the government. Yea. Makes us want to run right out and buy some of her over-priced schlock. Vera baby, how about you wave that Chinese Communist flag next time you have a news conference to release disinformation? It's more fitting.